So I’m in France, where they are much better at making wine than the English but not as good at selling it. I mean, they’re great at selling their own wine, but pretty useless at accepting that anybody else, even the Italians, might have a product worth adding to their shelves. Which is bad for the French, but good for the English bloke in France for a fortnight and happy to try something local and obscure. Having been fairly emphatically disappointed by the selection in my local Carrefour, I found myself in a town I had never, until the moment I arrived there, heard of and went in search of something better. It was a short search, and ended at a small shop which sells cold meats, teas and coffees and a selection of wine that had burst out of its allocated shelves and into a couple of fridges and assorted wine racks squeezed into improbably spaces around the shop. I recognised a couple of labels from Les Caves de Pyrene, and engaged the owner in conversation about natural wine, which turned out to be his passion. I pointed to a wine called Le Soif Du Mail, which I tried at the Les Caves sale and enjoyed so much I bought four (sitting, with the rest of the Les Caves booty, in my parents’ basement for the time being). “Well,” he said, pointing to one of his wines, “if you like that, you simply must try this.” The wine he was pointing to was called Il Fait Soif, leaving the possibility that he thought I simply liked wines with the word soif in the title. “Oh, and this. And you’d probably enjoy that.” Neither of the last two wines had the word soif in the title. And so it was that on my second shop review I abandoned the randomiser and just bought everything he pointed at. Reduced to 10 Euros from a little under 14 because they want to move on to the latest vintage, this is made by Maxime-Francois Laurent, who also works with his mother at Domaine Gramenon. In America it costs $30 and is sold as one of the finest Cotes du Rhone on the market. I’ve struggled to find out much about it – the label is singularly unhelpful, there’s no rear label at all and Maxime-Francois doesn’t seem to have much of an online presence, but it appears to be “un cuvee de grenache”. It’s really excellent for the (my) price – very leathery odour, but quite a complex array of berry flavours and an incredibly peppery aftertaste. Really very peppery indeed. Excellent late-summer sit-outside-with-your-feet-up wine. Another hit. 71% grenache, 8% mourvedre, 6% syrah, 6% carignan, 4% counoise and 5% cinsaut. Cuvee Beau Nez, it’s called. Quite wild aromas (and with the wine glasses I’ve got at this rented villa it’s amazing it can smell of anything) of bramble and menthol and leather and tar. Amazingly vibrant fruity palate, really juicy. Again, not a jot of sulphur, but a better advert for the practise than the last. 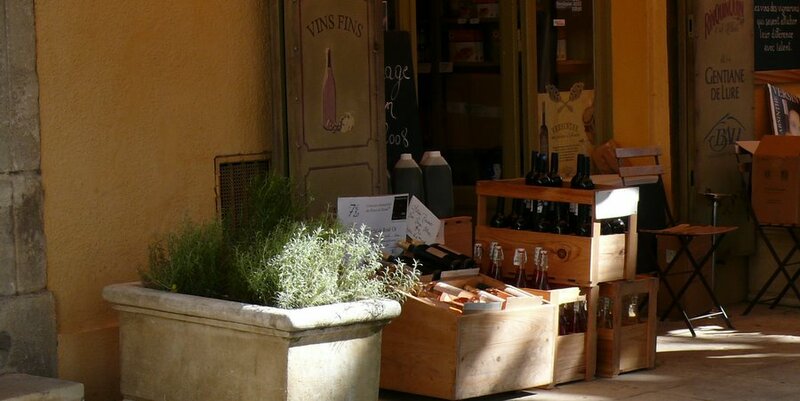 This entry was posted in Uncategorized and tagged Forcalquier, France, Natural wine, Provence, Shopping. Bookmark the permalink. Funny – just came across your blog, and noted the first post was about l’Épicerie Fine in Forcalquier, which we recently discovered, too. A real gem; after slogging through the tourist-ridden and market we were delighted to find that shop and its passionate owner, who turned us on to a few under-the-radar vins naturels (e.g. the Tavel rosé from l’Anglore, which he described, accurately, as “démentiel.”) He also sent us over to a tiny restaurant, called “In Vino,” which, should you find yourself in Forcalquier another time, is well worth the visit (lovely food, honest prices, thoughtful and interesting wines, nice people, few, if any tourists even on market day).